The figurative painter Lina Viktor’s studio is located on the sunny, noisy side of a nondescript office building in New York’s financial district. Just one block away from Ground Zero—that loaded piece of Manhattan history—she commutes daily from her apartment in the Upper West Side. In that studio, art books are meticulously stacked away in thematic piles. 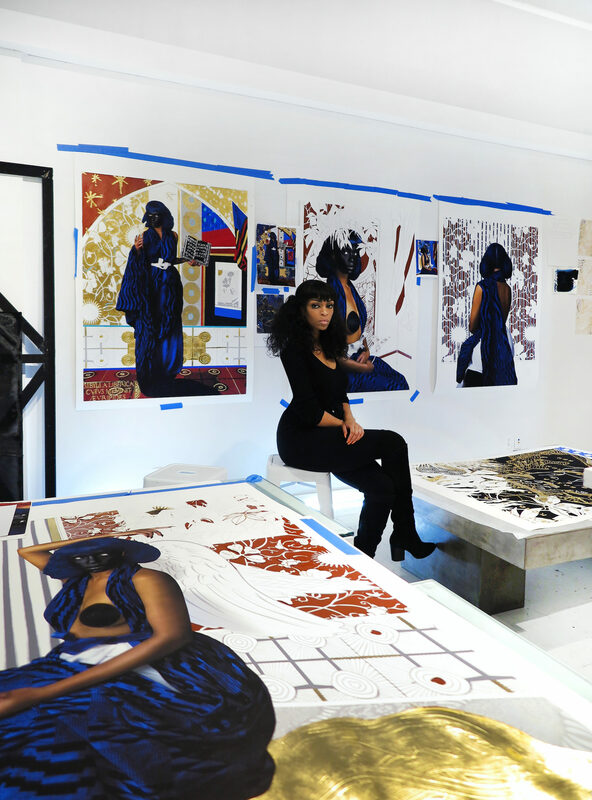 Judging by some of the more visual tomes popping out of her shelves—or the images assembled on her mood board—she seems to be labouring away under the watchful eye of some of Africa’s most creative luminaries, including the British-Nigerian painter Chris Ofili and the British-Ghanaian architect David Adjaye, whose practice is just a few blocks north of her studio and whom she refers to as a friend and mentor. When Lina first moved to New York in 2003, to attend Sarah Lawrence College, she was living in Yonkers, about 30 kilometres north of her current studio. Born in Virginia and raised in Britain, she is the offspring of prominent Liberians who had to leave Monrovia and their home country in 1980, during the civil war, under very difficult circumstances. The reality of forced exile for her family informed much of her recent, more political work, and on the day I visited her last week she seemed very concerned with modern African identities, and the powers regular citizens do and sometimes do not have to determine their leadership. We talked a lot about the harsh legacies of African colonisation—and decolonisation—when compared to times when much of Africa was about regality, celebration, and older forms of pomp and circumstance. Slowly, I was able to see a new set of meanings in her paintings. 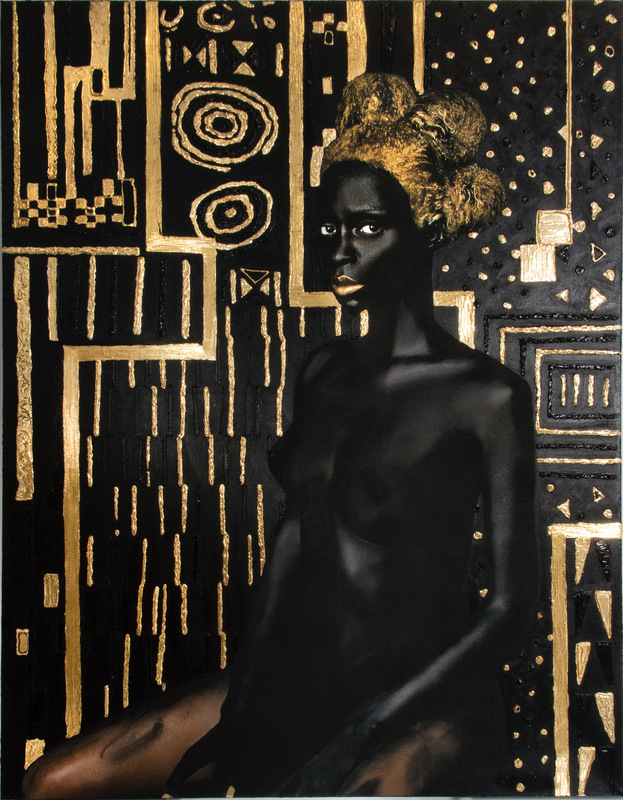 ‘All my work is drawn from an African or Afro-diaspora narrative,’ she said. ‘I look at the cosmologies of a lot of different African cultures. I’m very drawn to the Dogons of Mali, to Nubian culture, to Ancient Egypt, and I pull all these cosmologies together with other cultures I am interested in, like the indigenous Australians, and I see all these parallels. Sometimes, people say that her paintings are derivative of Gustav Klimt, because of the gold, and also because of the symbols. Beyond the academic overlays that she tends to express in describing her process, particularly when she refers to shows with titles like Eleven Meditations on Illumination, the quality of the art currently being produced in that studio is top notch, with many interrogations around the role Americans and Africans played in the creation of the Republic of Liberia, which began as a 19th century settlement of freed slaves and free-born African Americans. no.14 / dark continent series on view @marianeibrahimgallery january 25 – march 25. 2017. back stories. a triptych – nos. 9, 13, & 14 on view. Our conversation afforded a great opportunity to discuss how far she has come since I first met her in New York a decade ago. Back then, Lina was a young graduate working at Spike Lee’s 40 Acres and a Mule Filmworks, in the Fort Greene neighbourhood of Brooklyn, and I had no idea that she was already thinking of shifting gears and eventually establishing herself as a painter. It turns out, Lina is now ready to leave New York. ‘It’s the kind of city you move to when you’re younger. It gives you a lot of energy, and when you’re younger you need that external motivation. The people you meet are all kind of hungry, and you tend to have similar objectives. It’s that singular vision that everyone has, as they try to achieve, and be someone. You need that when you’re trying to figure out what you want to do, but there comes a time when you realise you don’t need all those distractions. She has started making plans around a future residency in Europe. She has a solo show opening in New York, in February 2018, which she sees as her ‘hello and goodbye’ to the Big Apple. Her plans include traveling across the African continent. She wants to discover Liberia, an imaginary homeland she has never visited, Ghana, Mali, Senegal, Ethiopia and the Democratic Republic of Congo, where the musician Yannick Ilunga—better known by his stage name Petite Noir—is originally from. 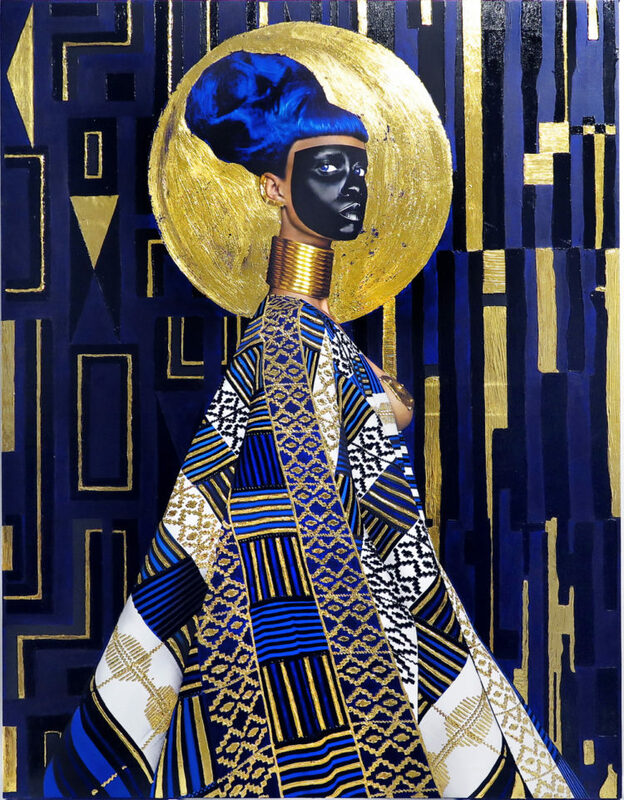 She created the artwork for some of Petite Noir’s most successful productions, and those kinds of collaborations seem to point toward a new series of projects where she might be able to cast her intentions into the language of music and other forms of popular culture. Her next presentation—part of a group show—will open in May, at the Wifredo Lam Centre for Contemporary Art in Havana, and she seems to be focused on that. For now. 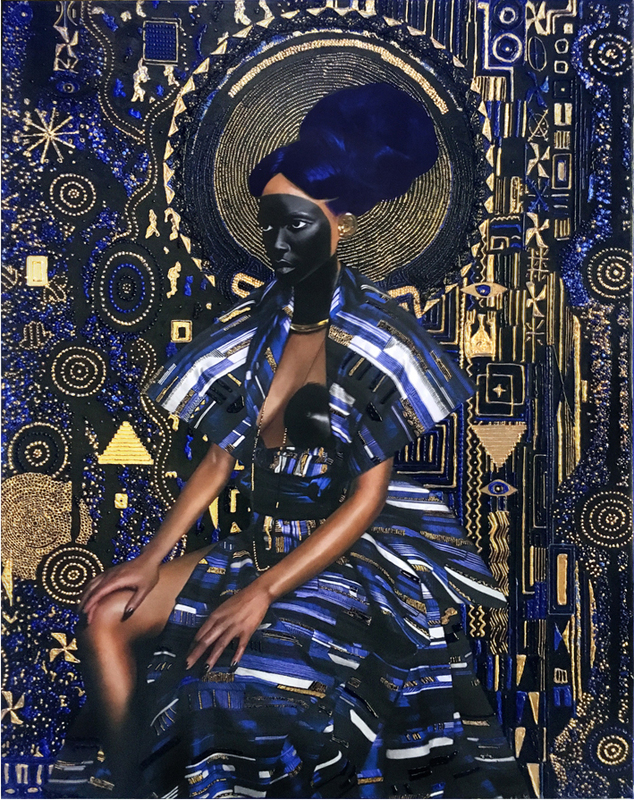 Now that she’s gotten what she calls ‘that education by hard knocks’ in New York, she seems to be in a better place, and there’s momentum clearly building around her modern African representations. In many ways, Lina Viktor is a transcontinental messenger, navigating between between old and new worlds, in search of myth.